Last week I had the pleasure to attend the Preview of Kazu Huggler latest Tan collection celebrating her 15 years anniversary into fashion design. Beside being an outstanding designer with a penchant for story telling that connects the two worlds of East & West in a uniquely graceful and exquisite way, Kazu is also a remarkable woman who has genuine compassion for humanity, a sensitive nature and a refined taste for beautiful fabrics that can unlock every woman’s body language. Kazu Huggler is the daughter of a Japanese mother and Swiss father. Born in Tokyo she learns about the two cultures from her early childhood years. After graduating from high school in Zurich, Kazu studies Japanese art history and Aesthetic in the Keio University in Tokio. Later she studies at London Central Saint Martins and works as an intern with Vivienne Westwood. With her Tan collection Kazu Huggler is developing a new interpretation of the traditional Japanese hand-made kimono. 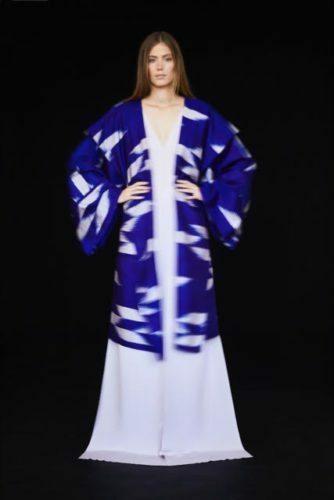 Every creation of the collection is one-of-a-kind and is made out of a real Vintage Kimono Fabric. Each of the fabrics has been chosen by the designer herself during some of her trips to Japan. The idea is that people can come to the KAZU Label Atelier on Ankerstrasse 122 and choose their favourite vintage fabric or kimono, which then is altered according to their personal body proportions. Several silk fabrics from the collection were woven in Nagahama and dyed in Kyoto following KAZU private clients’ wishes. “The philosophy behind my Tan collection is a natural progression of the KAZU label concept for uniting the Japanese and Swiss cultural backgrounds in a very aesthetic and harmonious way. This is a philosophy oriented towards the needs of the customer, towards sustainability and in perfect balance between past and presence”, says the designer. You can still visit the new KAZU label store and see some of the Tan pieces or find out more about the designer and her philosophy on her page.